Its not a surprise for us to see helicopters roaring all around the clear sky above us. But it will, of course, be of great significance when a helicopter will fly to Mars. Yes, you read that right, NASA has been planning and testing helicopters to send those to the red planet. 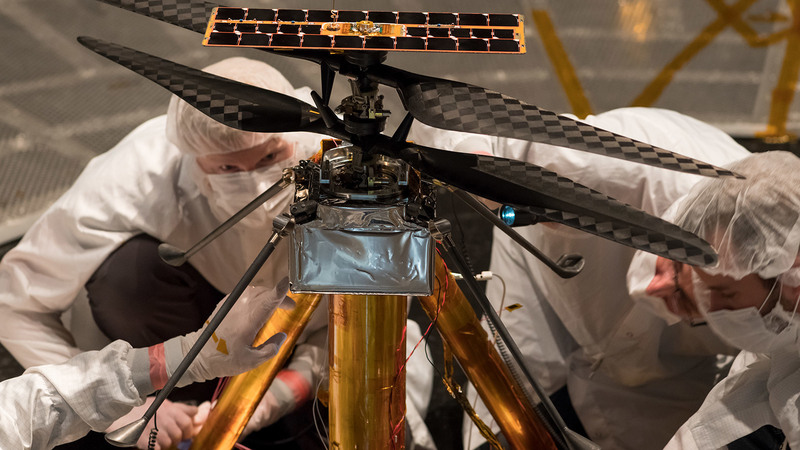 The helicopter to be sent is called The Mars Helicopter it is a small autonomous rotorcraft and it will travel with the agency’s Mars 2020 rover mission, currently scheduled to launch in July 2020, to demonstrate the viability and potential of heavier-than-air vehicles on the Red Planet. If you don’t know about Mars 2020 Rover mission then it is a mission by NASA’s Mars Exploration Program with a planned launch on 17 July 2020, and it will touch down in Jezero crater Mars on 18 February 2021. It will investigate an Astro-biologically relevant ancient environment on Mars and investigate its surface geological processes and history, including the assessment of its past habitability, the possibility of past life on Mars, and the potential for preservation of biosignatures within accessible geological materials. Although the helicopter is not an integral part of the mission it will only be an addition to a mission already set i.e Mars 2020 Rover mission. But it will be of great importance for future technology and also it becomes successful then it will fasten our path to space technology and will also be of great help in making the humans multi-planetary. What will the helicopter do? 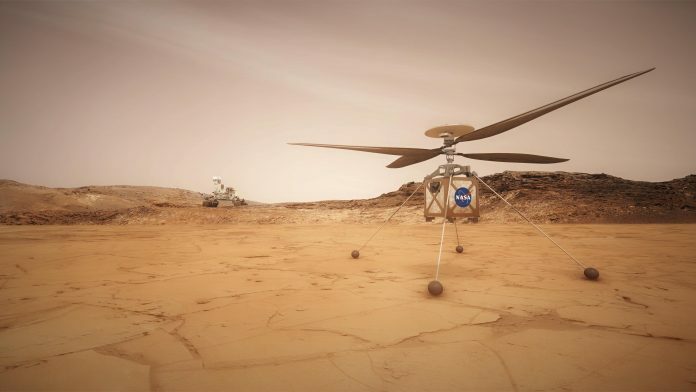 The Mars Helicopter will ride to Mars attached to the undercarriage of the Mars 2020 rover. Several months after landing on the red planet, the helicopter will take to the skies for a series of 90-second autonomous flights. The small helicopter will enable scientists to remotely explore regions of the planet’s surface far from its mothership’s landing site, according to NASA. It will be sent to Mars as a technology demonstrator, which means if it doesn’t work, the Mars 2020 mission will still succeed. If it can fly to Mars and survive there it will help the scientists of Earth to gain a lot of knowledge about the red planet and search if any inhabitants ever lived there and it will be of immense help in space technology and future space invasions. How is the helicopter prepared? 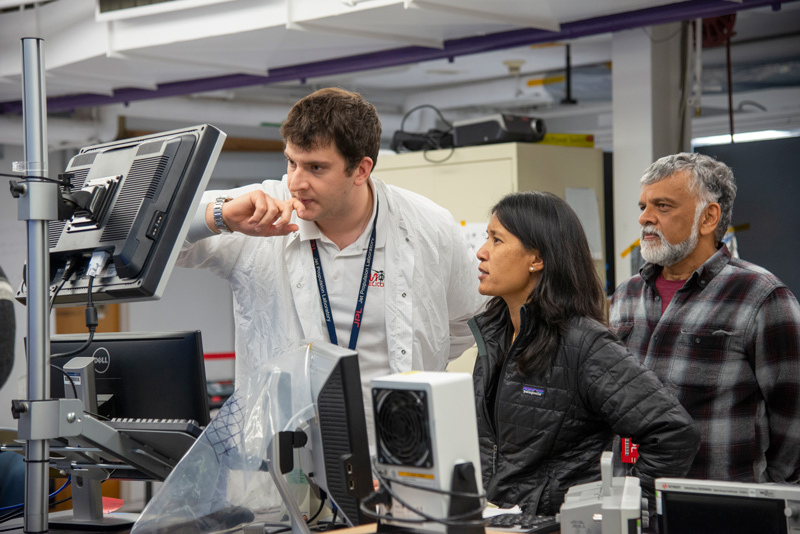 via Monitoring the Mars Helicopter: Teddy Tzanetos, MiMi Aung and Bob Balaram of NASA’s Mars Helicopter project observe a flight test. Survival on Mars is not a bed of roses, and if you want to send a flying object on mars neither that will be very easy as the temperature and topographical conditions of Mars is totally different from that of Earth, and also it has got a very thin atmosphere so the red Planet might really be a red signal. Before letting the helicopter fly to Mars the scientist had to make an atmosphere similar to Mars and test it. The closest analog to Mars on Earth would be the atmosphere at an altitude of 100,000 feet. And it was possible because NASA has a giant vacuum chamber conveniently located on the surface. via Mars Helicopter Team Prepares for Test: Members of NASA’s Mars Helicopter team prepare the flight model (vehicle going to Mars) for a test in the Space Simulator. 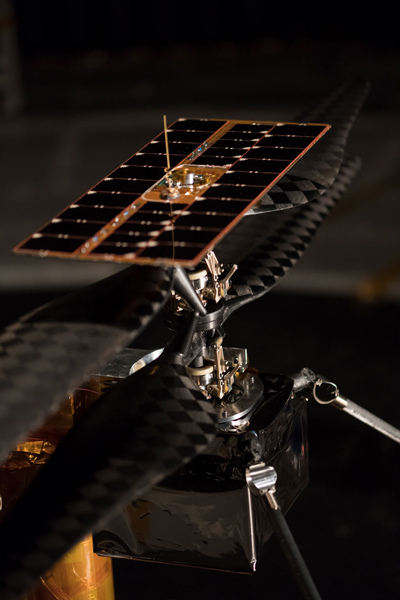 To simulate the conditions of Mars, the team removed all the Earth atmosphere from the chamber and then pumped in carbon dioxide until it matched Mars’s atmosphere. That’s about 1 percent of Earth’s atmospheric pressure. Next, the team had to deal with gravity. Gravity on Mars is very less as compared to earth it has just one-third of Earth’s gravity, which makes it easier for the probe to lift off. There’s no way to change gravity on Earth, but a “gravity offload system” can fake it. And that’s the cable you see extending from the top of the helicopter. It tugs upward with a constant force, negating two-thirds of the probe’s mass. How will the helicopter look? The Martian helicopter will not just be like a normal helicopter it will be of a smaller size than an actual helicopter, it contains two sets of rotor blades – each four feet long, tip-to-tip – spinning at 2,400 rotations per minute, which is about 10 times faster than an Earth helicopter. 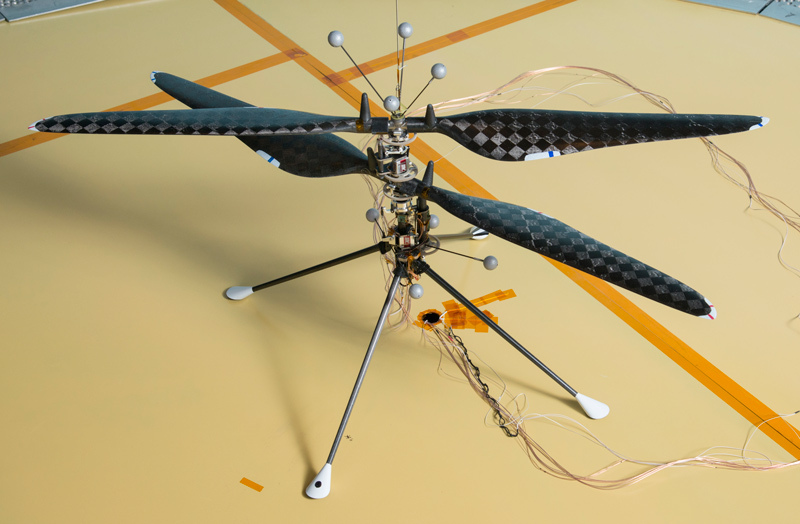 The interesting fact here is that the main helicopter body will also be really small — about the size of a softball and will weigh just under four pounds and thus due to its light weight it will be easily lifted. The helicopter will also have cameras in it so that it can take photos of Martian surface which will be of great help in research purpose. The researchers say that if this mission of sending the helicopter to Mars gets successful then they will send more helicopters in the near future to access more information. And that will be a great achievement in scientific history.